Logos, location markers, instructions and more are often embossed or stamped into sheet metal for a variety of reasons. Sometimes, like logos, they are part of the product design. For other situations, like critical instructions or markers, the intent is to make them permanent because the part may be painted in a separate operation, or things like labels might eventually wear off. This Solution Bulletin describes the difference between the two most common approaches—Cold Forged Emboss and V-Line Stamping—and provides some tips to optimize the results. A normal punch stroke shears metal and creates a slug. The view below shows how material is forged upward by stopping the punch stroke before the metal fractures and shears off as a slug. This process can raise material up to 50% of sheet thickness depending on ductility without fracturing the material. Very distinctive visible shapes or words may be formed to create a three dimensional effect, and may be any size up to the station maximum. For clear definition and readability, raise characters at least .016(0,4) to .020(0,5) above the surface. To minimize the sheet distortion that results from forming metal, the form height should be as low as possible. The best Cold Forged Emboss results occur in material thickness ranging from 0.040(1,00) to 0.078(2,00). 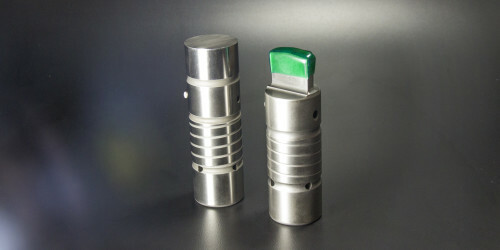 Maximum size depends on the tooling style, station size and press tonnage capacity. Stations adjacent to this tool should not be used. V-Line stamping renders the image with a thin, sharp line stamped into the surface. It requires relatively small force. Large, complicated images are possible using this technique. An accurate indication of each figure’s size, shape and depth below surface are required. Typefaces may be specified or artwork may be furnished, depending on the requirements of the subject matter. Within press capability, the figures may be any size up to station maximum. Material thickness ranges from 0.032(0,80) up to machine capacity.